We all know that switching from a QuickBooks hosting provider to another is not an overnight process. There are a lot of things – planning, execution, and testing etc. that are involved in the process that results in a successful migration. For businesses considering their first QuickBooks hosting migration, there are a lot of things that you should consider – from benefits to risk, from old platform to new cloud platform, and to knowing your options when you are all set up with a new provider. In this post, we’ll look at some points that you should consider while migrating your QuickBooks data and application to a new provider. 1. What is QuickBooks Hosting Migration? Existing Service Evaluation: Evaluate your existing QuickBooks cloud service. What is the business case that drives your migration to the new cloud provider? Search for New Provider: Time to look for a good hosting provider If you have hosting issues such as cost, poor performance, security issues etc. 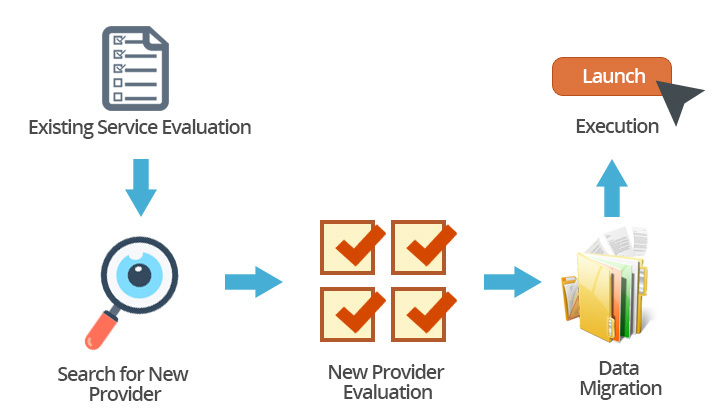 New Provider Evaluation: Evaluate a new provider on various parameters such as – cost, performance, customer support, industry recognition, and understanding of your business and QuickBooks software before making a switch/migrating your QuickBooks data and applications. Data Migration: If you have chosen the provider, this is the time to migrate your QuickBooks data and application from your existing provider to the newer one. Execution: Finally, as QuickBooks is migrated, you learn and adopt the new platform and constantly iterate toward the new operating model. There are some common signs that indicate that it’s the time to switch to a new provider. 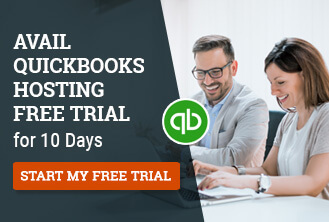 Poor performance, security issues, not delivering on SLAs, and hidden and increased costs are some of the red flags that make businesses switch from on QuickBooks hosting provider to another. If any of these issues sound familiar to you, then it’s a right time to migrate your QuickBooks hosting to a new provider. ➵ A good provider can help you reduce your operational costs. Affordable solutions such as pay-as-you-go pricing can be handy if cost is an issue with the existing provider. ➵ The migration can offer you enhanced security, protection and better access control for your QuickBooks data and application. ➵ Migrating your QuickBooks to a good provider provides you with disaster recovery, business continuity, and regular data backup services that prevent disruptions to your QuickBooks cloud service and ensures your QuickBooks is always up and running. ➵ If you are suffering from poor performance and speed issues with your existing provider’s cloud, migrating to a new provider can help you get a super fast access to your QuickBooks application and data along with a predefined cloud uptime guarantee such as 99.999%. ➵ The cost, quality of support, and the medium (such as chat, email or phone) by which it is delivered can significantly hamper or boost one’s cloud success. If you have poor customer service with your existing provider, don’t wait to migrate your QuickBooks to the customer-friendly provider with 24×7 available support options. What do you know about hosting QuickBooks? Are you an Intuit authorized hosting provider? If my business grows – users, applications, is it hard to change plans? Can your cloud hosting scale up to meet my business needs? Who can see my QuickBooks data? Who’ll have the access to my data? How secure is my QuickBooks application and data on your cloud? Where is my data actually stored geographically? What service uptime do you commit to? Do your offer pay-as-you-go plan? What are pricing structures and special offers for my business? How secure is your cloud? What happens if I lose my data? What customer support services do you offer? How will you provide me help (not just knowledge base articles) if I really get stuck? Do you offer business continuity and disaster recovery services with your hosting plan? Transitioning to the cloud of the new provider may present the usual IT issues such as interoperability, data integrity and QuickBooks data and application portability. But with early planning, businesses can outline a plan how they’ll approach migration process. While most QuickBooks hosting provider makes it easy to migrate QuickBooks data and application to their platform, however, the process is not simple because two cloud environments may not alike. Let’s take a look at some important things that you should consider during QuickBooks migration process. On-boarding to a new provider requires portability and interoperability of your QuickBooks application and data that can be moved to the new cloud environment. Simply put, portability refers that you can access your data and application across different cloud platforms. On the other hand, interoperability refers to the seamless integration, support, and working of your application with the cloud and different applications and add-ons. So, before migration, always make sure to ask your provider about the data and application portability and integration with other applications offered. Assess your existing configuration and identify what data, applications other than QuickBooks to migrate to the new cloud provider. While a lot of cloud functionalities doesn’t require support because the cloud is always projected as easy to use and “self-service” technology, however, there are still many scenarios where a customer want assistance and instant solution for a problem from a cloud service provider. An assistance is required before, during and after migrating QuickBooks from one provider to another. This could be on setting new user permissions, integrating QuickBooks with other applications, setting printers with QuickBooks etc. Make sure that your new provider is available 24×7 to support you via chat, email, phone or any other medium on which you want to connect with them. Do they have Knowledge Base or other documentation to search for a solution? What so their existing clients say about their customer service? The answers to these questions can ensure that you are not helpless when you need support. Service uptime simply refers to the amount of time that QuickBooks application hosted by a service provider is accessible to you. Cloud service availability is usually expressed as a percentage of uptime in a given year. The following table shows the downtime that will be allowed for a particular percentage of the availability i.e. corresponding amount of time your QuickBooks hosting service would be unavailable. How fast will my QuickBooks and other application work on the cloud when it is up and running? What happens if cloud service goes down? Do you have any backup servers? Is scheduled maintenance etc. is included in the uptime guarantee? Does your SLA include all your actions that you will take for service downtime? Is there any uptime rewards in the service agreement? Migrating to the new provider can also mean added costs, but, in reality, these costs wouldn’t necessarily prevent businesses from moving a bad provider to the good provider given the positive impact that migration will have on the overall business. Make sure to ask your provider about the migration costs – Is the QuickBooks hosting migration free of cost or they charge for it? What special offer do they have for your business? Do they offer pay-as-you-go pricing model to suit your workload? It’s important to remember that most of the cloud pricing plans are based on the computing workload – storage, resources such as CPU, RAM, security and backup options and licensing etc. It’s always recommended that your SLA must specify cloud service cost, maintenance and other charges and the cost to discontinue using the service. Finding out a good solution for the security of your data while migrating from one provider to other can be challenging. Data breaches, unsecured interfaces and cloud platform, privacy breach and data loss are some of the major issues that one should consider while migrating their QuickBooks data to the new provider. Incorporating the following security measures will ensure QuickBooks applications and data protected from unauthorized access. Ask your provider what kind of access control, privacy protection and security control such as firewall, encryption etc. they have in place. Know what you are responsible for. Know who has the access to your data and application. Know their disaster recovery plan in case something bad happens. Always remember that long-term success with the QuickBooks cloud hosting migration requires detailed analysis to determining the needs of existing and planned workloads; the best, most cost-effective and reliable hosting providers, and locations for hosting data and applications, and customer support available. At Ace Cloud Hosting, we assess your business requirements, identify which cloud solutions are best-suited to your QuickBooks data and application to deliver the highest return on investment. By understanding the dynamics of your business, Ace Cloud Hosting’s cloud migration consultants can help you achieve extraordinary value at every step on your cloud journey. As an Intuit authorized commercial hosting provider, we deliver 99.999% uptime guarantee along with secure hosting of your QuickBooks data and application on our US-based data servers and built-in business continuity and disaster recovery solutions. Our super fast, reliable and affordable service speaks for us – we are User Favorite Award Winner for Best Application Hosting Provider in Accountex USA. Thank you so much for enlightening us with the pointers needed to switch the hosting provider. I was looking for the same since long. Hey Jason! I am glad you liked it. A complete guide for migrating your QuickBooks application. Thanks for sharing, it really helped me.